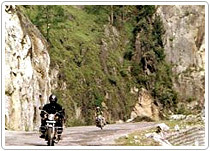 Motor bike safari is the best option for you, just like jeep safari to explore the Himalayan regions of India . You can even take your bike to those areas, where even a jeep cannot reach. Drive the highest motorable road in the world at 5621m! Meet Tibetan refugees, Yaks, visit beautiful monastries and experience the imense beauty of nature. Day 2: Train To Chandigarh . Drive to Mandi. Overnight Mandi. Drive through the beautiful Kulu valey to Manali. Overnight Manali.